For ALMA’s first observations in its new and most powerful mode, researchers pointed the antennas at HL Tauri — a young star, about 450 light-years away, which is surrounded by a dusty disc. The resulting image exceeds all expectations and reveals unexpectedly fine detail in the disc of material left over from star birth. It shows a series of concentric bright rings, separated by gaps. “These features are almost certainly the result of young planet-like bodies that are being formed in the disc. This is surprising since such young stars are not expected to have large planetary bodies capable of producing the structures we see in this image,” said Stuartt Corder, ALMA Deputy Director. Through many collisions the dust particles will stick together, growing into clumps the size of sand grains and pebbles. Ultimately, asteroids, comets and even planets can form in the disc. 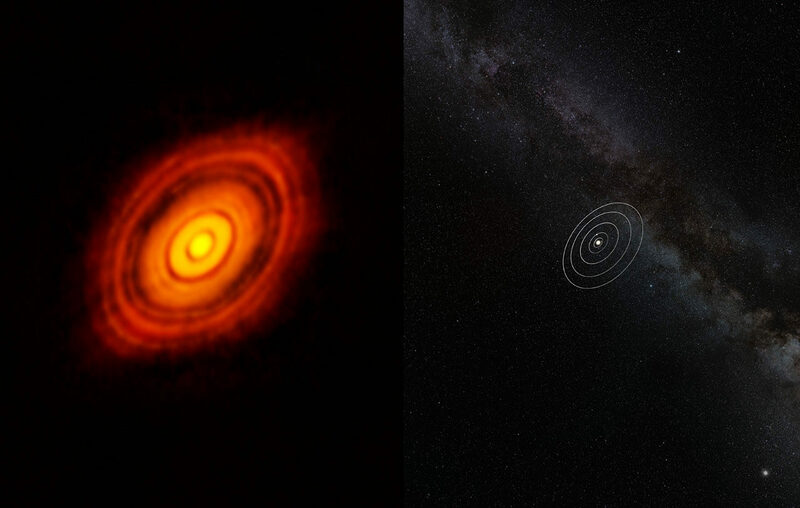 Young planets will disrupt the disc and create rings, gaps and holes such as those seen in the structures now observed by ALMA.